Revolutionizing healthcare with the love and truth of Jesus Christ. Compassionate client-focused training for people who care. We provide students with the necessary training and eligibility to take the State Nurse Aide exam. Provided under the authority of the American Heart Association. Whether you work in the hospital or in an office this training saves lives every day. Affordable and accessible. Fully ONLINE program prepare you for the national exam to get certified and licensed as a Pharmacy Technician in Michigan. Start a new career or take a step up in your current position! Get ready to make a difference! 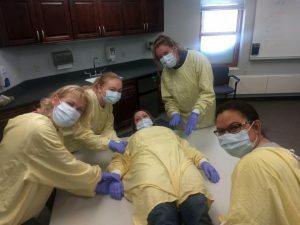 CNA Training up north – Gaylord OMH It’s great to have CNA classes at the Otsego Memorial Hospital again after a year break there. Thanks to Mary Steele at McReynolds Hall for Coordinating! It only takes an hour to save 3 lives. Join us June 9, 2017 at Agape School Traverse City Campus to help make a difference. Register online to save time, or just walk-in. - Contact us today for more information or check out our courses tab at the top.